Some riders are made of calmer stuff than others and it turns out some tyres are too. 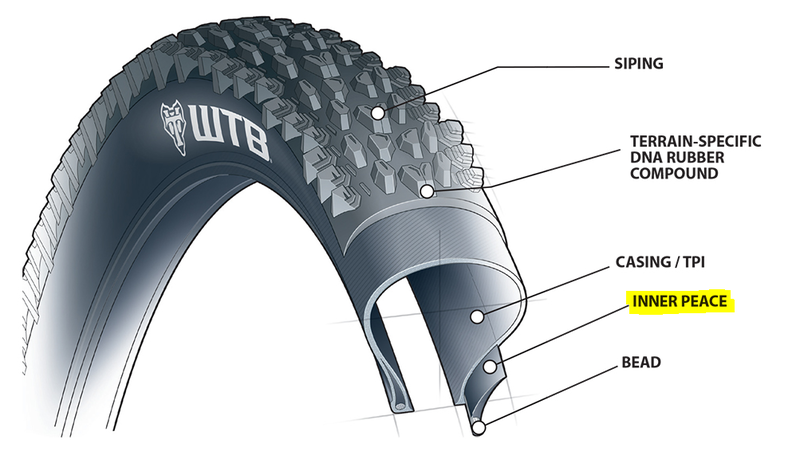 I just noticed that my new WTB tyres come with built in Inner Peace! >But that’s just a sidewall, er I mean side note. But it did make me think, that when riding technical trails there are many skills we need to possess to nail it, but there are many more things that we should put our trust in too. Since upgrading my ride to bigger wheels and forks, I have found that (understandably) the bike can take some bigger hits without my body feeling it so much. This has led me to let the bike do more of the work so I can concentrate on the task of balancing and steering. Getting your tyre pressure right, fork rebound set correctly and your saddle in the right position, means you can drop and roll and turn and slide around most things. Your bike’s suspension is designed to take the hits and to absorb the bumps so you don’t have to. So don’t fight. Well not quite, just stay calm and build up to it, and build your confidence in your abilities and also your bikes capabilities. Cam Zink can’t drop 70-80 foot or jump a 100 foot gap and walk away with out his YT Industries Tues. He has big balls, lots of skill and a big hitting bike. So, get some tyres with Inner Peace built in for starters! If that fails go book a session with Tony “the Jedi” Doyle at UK Bike Skills I have never been myself but I hear its great… I should give it a try. Peace Out and yes definitely Use The Force!